Domaine de la Vieille Julienne was acquired by the Daumen family in 1905 and has since grown through generations. Jean-Paul Daumen joined the family business in 1990. Making the vine and land his priority, the winemaker switched to sustainable agriculture by significantly reducing vines treatment, and eliminating the use of chemical products... Jean-Paul Daumen took into account various parameters to manage his vineyard: biodynamic agriculture, weather conditions, the moon, as well as planets. 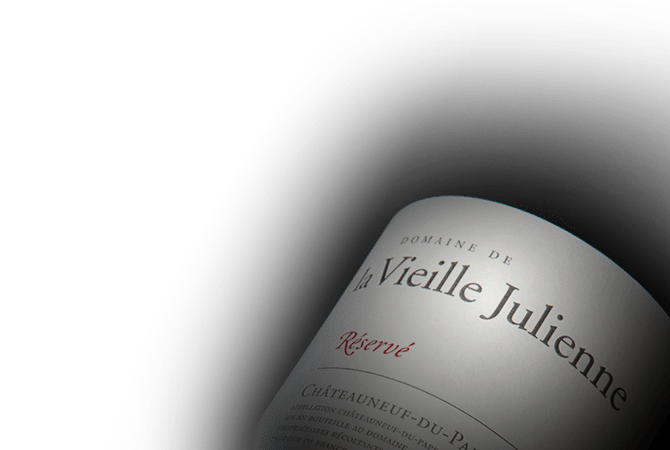 Within the Chateauneuf-du-Pape appellation, Domaine de la Vieille Julienne grows many varieties -Syrah, Mourvedre, Counoise, Cinsault- including the more rare Muscardin and Vaccarese. Chateauneuf-du-Pape wines are produced from 10 hectares while Cotes du Rhone vintages are produces from 5 hectares.